We cannot give a 100 percent guarantee that following these superstitions will hasten the moment of your wedding - but it is better to play safe, right? Since olden times marriage in Russian culture has been considered an overarching ambition for everyone. That is why Russia has so many superstitions related to marriage. RBTH has gathered 10 of the most common ones. Curiously, they all exclusively concern women. 1. The most well-known superstition: an unmarried girl should never sit at the corner of a table - she will not find a husband for at least seven years is she does. Probably the safest thing is to have dinner at a round table. 2. You should sweep the floor from the windows to the door, sweeping all the dirt away from the house. There is one more superstition related to sweeping: a girl should not sweep away from herself. People say that she will drive all her admirers away. In a nutshell: you go right away from the door and moving back you sweep in your direction. 3. 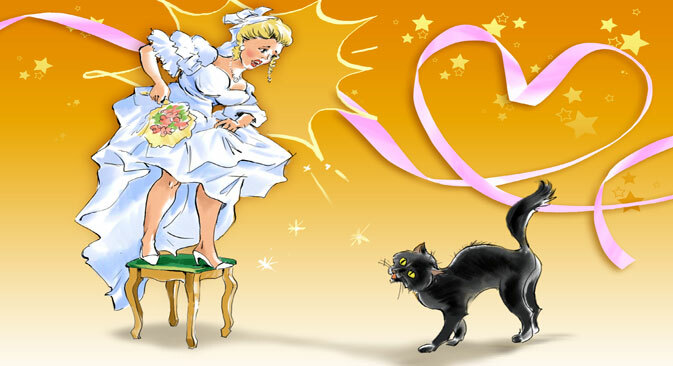 Several superstitions are connected with the wedding itself. Russians believe that it is an ill omen to try someone's bridal veil and wedding dress on. Otherwise the girl who did will never marry. This also holds true for toothbrushes. 4. A groom must not see the wedding dress before the ceremony - it brings misfortune. The majority of Russians still takes this superstition very seriously. And if it was not the groom who bought the wedding dress, best never to mention the price - knowledge of this can harm the union. 5. For some reason there are many superstitions related to the month of May. Being born in May or getting married in May means suffering all your life. This comes from the Russian wordplay - "mai" (May) - "mayatsya" (suffer). Those who are most superstitious would rather marry in February when it is 30 degrees C below zero (-22 F) than in "accursed" May. 6. An unmarried woman should not baptize a girl if the baby is her first godchild. It is believed that the girl will take away the godmother's happiness. But if the woman already has a godson as her first godchild, there is nothing to worry about. 7. From childhood girls are told that they should put their skirts on over their heads. If she dresses by stepping into a skirt and hoisting it up her legs, her husband will be unfaithful to her. Russians are still waiting for someone to patent a skirt that takes this superstition into account. 8. A young women should never wear a ring on her ring finger before marriage - she will end up as an old maid. Indeed, she will! All potential spouses will think she is no longer single. 9. If a woman's second toe is longer than her big toe, she will be the one who wears the trousers in a marriage. And vice versa. British scholars are still testing this hypothesis. 10. Russians believe that a woman should not eat looking in the mirror - she can eat her beauty with all the ensuing consequences. We do not know about what impact this may have on a woman's beauty, but the idea sounds positively perverse. Test: What do you know about Russian superstitions?